Presented by Ausdance WA, the MoveMe Festival is a showcase of contemporary dance, and it offers opportunities to West Australian independent choreographers and dancers. Anything is Valid Dance Theatre often uses non-traditional spaces for their performances. Dust on the Shortbread takes place inside a suburban house in North Perth for an audience of 15, who are seated on couches and chairs in the living room, observing but not interacting. Created by Serena Chalker and Quindell Orton with sound design by Tristen Parr and production design by Emily Stokoe, this loving, at times joyous, intensely moving, immersive dance theatre experience shines a gentle light, with sensitivity and respect, on the daily challenges and frustration of an ageing couple negotiating their way through the confronting world of dementia. 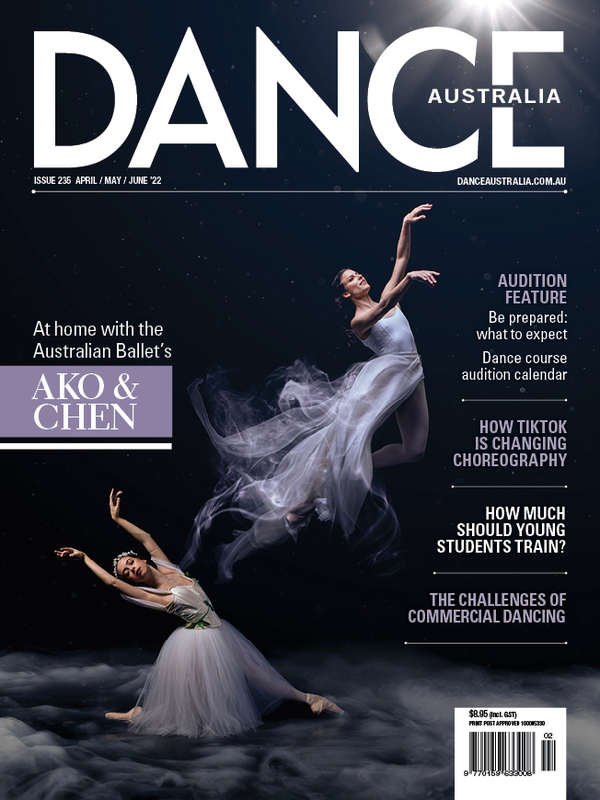 Two consummate, veteran artists, Elizabeth Cameron Dalman, founder of the Australian Dance Theatre, and esteemed WA actor George Shevtsov, wander busily about the house but sometimes seem unsure of their purpose. They sit together in animated ‘conversations’ although telling altogether different stories, as detailed memories from the past come and go. Sharing the calming ritual of making tea together, or tripping the light fantastic and dancing together to music, reassuringly unites them. Disarming and compelling, Dalman and Shevtsov are a perfect pairing, and both brought compassion, poignancy and veritas to their performances. Programmed as a "curtain-raiser" to Co3’s two new works in their WA Dance Makers Project, choreographer Richard Cilli’s This is Now for LINK Dance Company is an entertaining, satirical deconstruction of a cheerleading routine performed to warm up the crowd before "the big game". It is a sequel to Chilli’s 2017 work That Was Then created for WAAPA’s graduate group, and many of the same WAAPA students are amongst the 14 pre-professional LINK dancers. Creating their own rhythms, stomping, clapping and vocalising, before producing large, red pompoms which flood the stage with colour and movement, the dancers nailed the subtle satire and the required fixed, artificial smiles in a fast, physical, well-disciplined performance. The episodic structure of venerated West Australian choreographer Chrissie Parrott’s new work In-Lore Act II gives it a dark, arcane, cinematic quality, which is echoed in the new score created by composer Eden Mulholland, who melds cello, voice, and spoken word to haunting effect. Allusions to Nordic folklore are apparent in the staging and in the soundscape. In-Lore Act II centres on a domestic scene with a family grouped around a table, but all is not as it seems, with ever-present simmering anger and unrest apparent. The mysterious appearance of a young woman induces further disruption. A disconcerting, jagged, fractured, choreographic language with distorted body and limbs creates disturbing, startling images. Antler-like shapes emerge in the arms and hands of the dancers and extended, arched backbends recur in solos and duos. Two disquietingly merry young girls burst into a heel-tapping folkloric dance. Co3 dancers Tanya Brown, Katherine Gurr, Andrew Searle, Ella-Rose Trew and Zoe Wozniak met the demands of the choreography with skill, strength and dexterity. They were joined by guest artist, much-admired award-winning Australian dancer David Mack, who stepped in (and out of semi-retirement) at short notice to replace an injured dancer, and delivered a powerful, mind-blowing performance. You Do Ewe is created and staged by Unkempt Dance, comprising of Amy Wiseman, Carly Armstrong and Jessica Lewis. Co3 dancers Tanya Brown, Katherine Gurr, Mitch Harvey, Andrew Searle, Ella-Rose Trew and Zoe Wozniak revelled in this witty spoof on just about everything. With a handheld microphone and well-written, excellently delivered dialogue that motivates the movement, each dancer revealed some home truths about themselves. This was laugh-out-loud humour with a healthy measure of the absurd. Mark Howett’s lighting transformed the Studio Underground space throughout. And best of all was the exceptional technical standard, versatility and stagecraft of all of the dancers. Top photo: Elizabeth Cameron Dalman and George Shevtsov in a scene from 'Dust on the Shortbread'.